Aside from probably hearing some AC/DC songs being used in adverts the only real reference I had ever really come across was an amazing clip of a man unable to spell their name correctly on Australian radio. Thing is, I knew that they were hard rock and so I assumed I would not enjoy the album. I was wrong, but the only reason I was able to find THAT out was because I started this album by accident whilst writing up my post for Destry Rides Again and figured I would just keep it going and see how I felt about it. 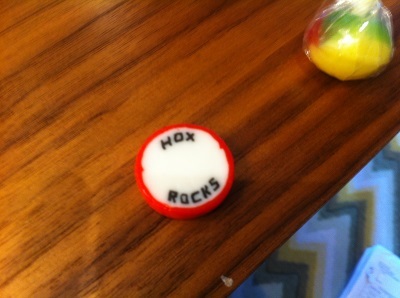 Now, I am under no illusion about being a sudden convert to hard rock. The closest I got to this as a teen was a symphonic metal phase with the likes of Within Temptation, Nightwish and Epica which isn’t exactly the same. Since this is really unfamiliar territory for my listening it’s another case where I am unable to make many touchstones to actual experience or to other acts I am aware of. All I know is that the songs all felt suitably grand and anthemic as to warrant multiple listens. I also seemed to recognise a lot more of the songs than I expected. Glad I put this on by accident. Going into this I expected Onibaba to be an actual horror film as that is what it has been designated on IMDB. I would dispute that label since while it has some horror elements in the final act it is mostly a period drama with a lot of dark overtones. Set during a civil war in the 14th century Onibaba centres on a middle-aged woman and her daughter-in-law (whose names we never actually find out) trying to make ends meet my selling the armour of soldiers that they themselves have killed after finding them lost in the surrounding tall grass. It’s a meagre living that has been working well until their neighbour returns. He brings news that the only relation that tied these women together is now dead and, in turn, threatens their singular world as he begins to forge a passionate relationship with the younger woman. The question I began to ask myself halfway through the film was “where is the titular onibaba” with onibaba being a monster taking the form of a hag. Whilst the older woman was really pushing it with how she was acting with regards to her widowed daughter-in-law finding a new man thus possibly abandoning her I have a lot of sympathy. She acknowledges how much she needs the girl and, by the end, gets desperate and who wouldn’t when you are someone who has pretty much lost everything and whose highlight of the week is eating the stray dog you just pummelled to death with a nearby boulder. I found my answer about 20 minutes before the end of the film where the mask from the film’s poster makes an appearance on a samurai who threatens the older woman to either guide him through the grass or be killed. She manages to outwit him and lead him to his death so she can sell off his armour… but she then becomes the titular Onibaba by donning the demonic mask and using it as a way to control a situation that was spiralling away from her. Yes, she actually wears a mask and waits in the tall grass for her daughter-in-law so she can scare her with fears of being sent to hell for engaging in extra-marital relations. It’s under-handed, but I actually found it pretty funny how gullible the girl was. But, as in all movie traditions, this backfires. The final sequence where the mask is stuck on the older woman’s face is truly harrowing. Her screaming in pain as her daughter-in-law turns the tables and relishes with her new power is just staggering. I mean, I get it. Your crazy mother-in-law has been dressing up as a demon to scare you away from the man you lust after. Fine. But taking as much relish in bashing her in the face with an axe as a means to remove a mask that won’t come off? It’s beyond sadistic. The ending chase through the tall grass as the older woman, whose face is now a bloody mess, pleads with the daughter-in-law that she is a human and not a demon is nothing short of tragic. It’s a film that stays with you and has made me question what I would be doing if I was in the same position as the older woman. Would I allow myself to be abandoned or would I use every under-handed trick in my arsenal to ensure my survival? I just hope I don’t have to find out. Since westerns are not a genre of film that I wasn’t really exposed to as I was growing up I feel like I have a lot of catching up to do. Now, having watched Destry Rides Again, I finally get Madeline Kahn’s character in Blazing Saddles. Seeing that James Stewart is in a film usually means, at least to me, that I am probably going to enjoy it on some level. He is one of those great and dependable actors who would be near the top of my favourite actors list. Marlene Dietrich, who I have now seen in five rather different roles, is similarly starting to make that climb. Two actors of this calibre headlining a film just lifts everything around them. The thing is, that Destry Rides Again really was a case of two very well known actors deciding to play against type, and having a boatload of chemistry whenever they are paired in a scene. Shanghai Express and, to a lesser extent, The Scarlet Empress sees Dietrich displaying great refinement, in Destry Rides Again she is able to play a more vampish role like when I fell for her in The Blue Angel. Stewart too had a change with his character having a real air of authority and danger whilst still being a good guy, whereas he would normally play a good guy. In many ways this is a typical western with a new sheriff trying to clean up the town he has just been appointed to. In this case, however, the new sheriff is the former town drunk who only gained this position as the mayor thought he would be easy to manipulate. In fact, Destry Rides Again puts a few ideas on its head with the only fistfight in the film being two women in the bar. Also, the ending confrontation sees Dietrich’s character Frenchy rally the women of the town to take on the outlaws barricading themselves in the bar. Okay, they do so with rolling pins which feels a little much but it’s a twist. It’s a good, solid western. Not the best (The Ox-Bow Incident has yet to be dethroned) but a good watch. It has been a long time since I had a week that crossed off so many items on the food list. Having combined the lists from both books I am back in the mindset of finding a lot of the easier foods so the version I carry on my phone is as up to date as possible. The previous week has been a stressful one for me in terms of work. Small potatoes compared to my last job, but it has meant that a visit to Gourmet Burger Kitchen was in order after pulling a bit of overtime. Whilst I would agree it is a bit strange that these would feature on such a list I find myself not caring too much because after a long day sometimes all you want is a burger and a shake. 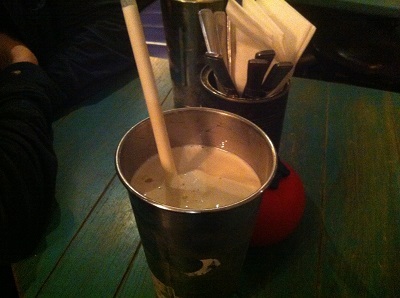 Also, I’m a bit of a traditionalist when it shakes so a vanilla shake was what I was going to order anyway. It’s bad, but I honestly felt better afterwards. Wednesday means dinner around my mum’s place and since I moved to the new list where there are actual dishes I think we might be trying some of the recipes out. 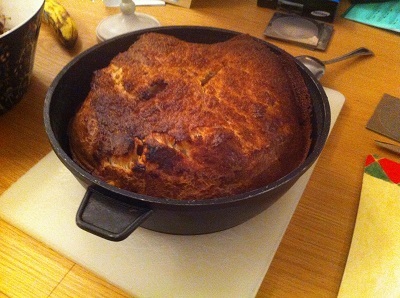 This week was something she makes well, the Nigella Lawson spin on toad in the hole. It came out a bit more poofy than normal, and the pan may have fused with the board underneath due to melting the plastic (whoops), but it is something that is always delicious and comforting. 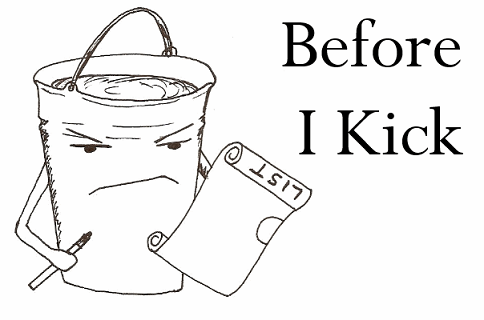 The only thing from the old list in this post. I had previously tried to get my partner to procure me some rock during his work trip to Brighton, but he either forgot or refused. Can’t remember now. Anyway, I got some for free at a venue for work meetings so I was gleefully sucking on this whilst everyone was getting a little bit frustrated. Little pleasures an’ all. Chicken kiev and baguette is not a meal that I actually had, that would be a bit of an overkill, but I have had these two so often in my life that it feels weird writing much about either of these foods. 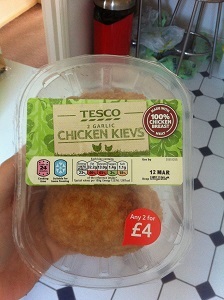 Having a partner that doesn’t eat poultry does, however, limit my chances of getting in something like a chicken kiev so if I am alone for a dinner or a lunch it is basically to get my chicken on and have a white meat fest. 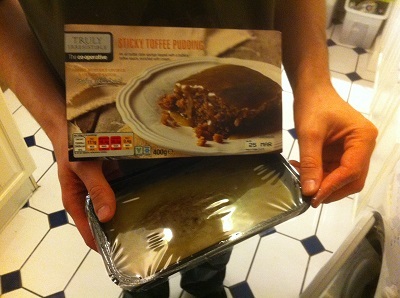 I had never had a steak and kidney pudding before. 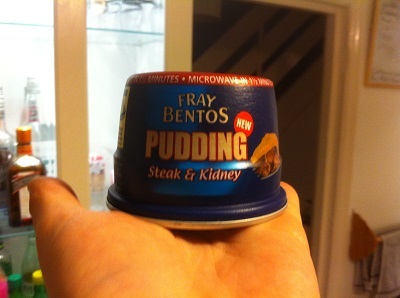 I had previously eaten the pie version of it a lot and loved it (usually the Fray Bentos version because of the pastry) and I have to say that I might be a convert to the pudding side. I know that suet pastry is NOT what people should be eating on a regular basis because of the amountt of fat, but it’s just so soft and tasty. Whilst this was cooking I may have had a look of whether this would allow me to cross off the lamb kidney’s from the list, but these were pig kidneys so I may have to get some lamb kidneys to devil at some point in the future. As for the pudding, that was a case of tipping the whole thing into a bowl and sharing on the couch whilst binge watching the entire first season of Unbreakable Kimmy Schmidt. No regrets on either count there. 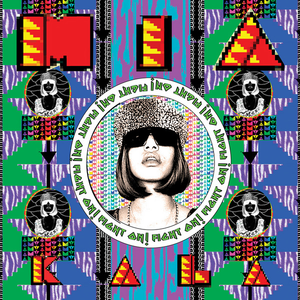 Acclaimed Albums – Kala by M.I.A. I think everyone who is into their music as a teenager has that moment when their parent comes in during a song and they ask “What is this noise?”. For me, that moment was during the Christmas break from university in 2007 and the song ‘$20’. I guess I can see why, the production is dense, loud and full of unusual sounds mashed together, but I loved it and I love Kala as an album. There is something exciting about listening to an album for the first time and really liking it despite it being like nothing you have really heard before. It was one of those immediate love moments on my first play through with ‘Jimmy’, ‘$20’ and, the now classic, ‘Paper Planes’ standing out to me immediately. ‘Jimmy’ really was one that I latched onto straight away and probably ended up a few times on repeat before finishing Kala. I guess, when I think about it more, ‘Jimmy’ is one of the most accessible tracks on the album. Even more so if you have been into electro-pop for a long time. Pretty much every track has since won me over in the years of spinning the album since with the exception of ‘Mango Pickle Down River’. I love the beat in this song and think the didgeridoo makes it unique, but I can not stand the rapping by the young boys. Some think it’s adorable, I think it’s bloody annoying. The rest of the album though has wormed its way into my musical consciousness to the point that I just fancy listening to the album at the most random moments. I have been known to put ‘Jimmy’ on just to spin around the room to the chorus. I even felt the need to invest in the bonus disc where ‘Shells’ and ‘Big Branch’ managed to keep me occupied in the gap between Kala and Matangi where /\/\ /\ Y /\ occurred (I mean part from ‘XXXO’ nothing on her third album managed to grab me). At some point I might end up writing up Arular as it is bubbling under the 250 and is getting closer. So who knows, the next update may bring that in. Okay, so I actually saw this a month before the Academy Awards and, after a lot of procrastinating, I have finally gotten around to my own two cents about it… with a lot of movies having been seen in between so of course my brain is a little rusty. Firstly, whilst I said a while ago that, “I’d love a film like Birdman to gain the title…” if I am being honest it is not the result I would have really wanted. In many ways, I am glad that a film like this did win. I mean, it does not feel like a typical Oscar film and that is one of the reasons that I loved it. This is definitely due to the mostly non-American crew as this felt more European than American. I mean, I can see how this could have won. The incredible cinematography that went into making the whole film look like it had been shot in one take? Breathtaking. 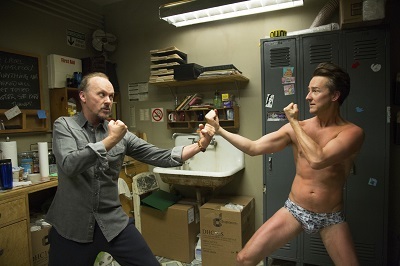 You also have amazing performances from Michael Keaton, Emma Stone and Ed Norton to contend with. The intelligent way that the film deals with various aspects of mortality and the importance we attach to actors and critics. Thing is, of the Best Picture films that I saw I would rank it third behind The Grand Budapest Hotel and Boyhood. I mean I can see why this would get the award over a more obviously comedic film but why not Boyhood? If you can not win for a film that was shot over 12 years, deals with philosophical questions of growing up and scores 100 on Metacritic then… what can you do. So today at a work meeting in a local hotel I actually managed to eat another food item for the list, but since I had left my mobile phone in the locked room I was unable to take the picture to prove it. D’oh. Means I’ll just have to find a recipe for risotto primavera or luck out in the future. In any case, when I got home from work I was due to cook something from the new book with a recipe from the same book: ants climbing trees. Mix the soy sauce, sugar and sesame oil together in a mixing bowl. Add the pork mince and combine in the marinade, leaving for 10 minutes. 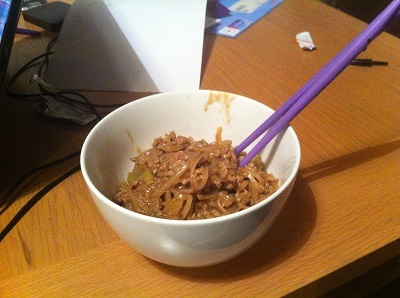 In the time you wait for the pork to marinate add the rice noodles to a bowl of hot water so they are able to soak. Heat the oil in a wok and fry the Tabasco, ginger and spring onions for a minute. 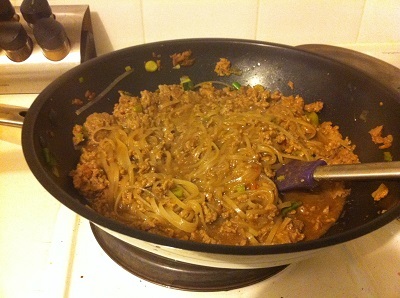 Add the pork and cook until browned, then add the noodles, water and chilli sauce. Stick a lid on the wok and cook until most of the water has been absorbed into the noodles. What can I say? 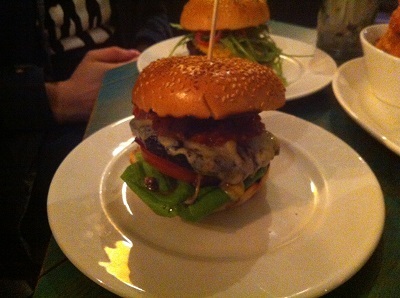 Diet be damned I ate more than one helping (and possibly more than two). All of this beautiful food was consumed on the Sunday where I spent pretty much everything in my savings on my future honeymoon. Food is a great comfort when you have spent a lot of money. Thanks again to Wholefoods for supplying me with something list-related and rather expensive if I had bought a lot of it. 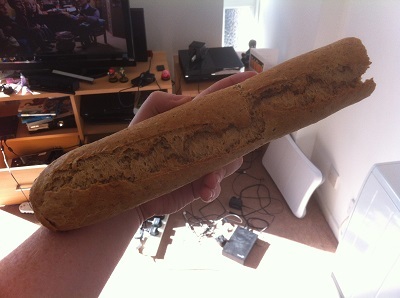 Yes, I managed to find some salchichon de vic and it was really good. It was a lot harder than I expected from something akin to salami… but with it’s savoury flavour, hint of pepper and a prolonged and pleasant after-taste this is something to revisit in the future. 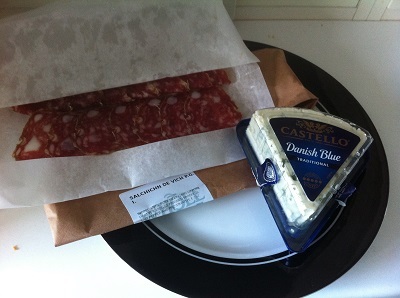 Then there is Danish blue cheese, something I am happy to see from the new list. It is one of those things that I usually use when I make Cobb salad (something I need to make again for the sake of the new food list and general deliciousness). It’s not viewed by many as a great blue cheese and because of that it is actually rather cheap. The thing is that it’s one of those cheeses that can get people into blue cheese because it has that distinct aroma and flavour and yet it is so creamy that it doesn’t feel so intrusive when eaten. I had a taste of this before I used this in the pizza. I have to say that I really enjoyed the taste of the hazelnut oil, it smells strongly of hazelnuts and tastes like a mixture of the nut and of pumpkin seed oil. I can see this being good in salad dressings. 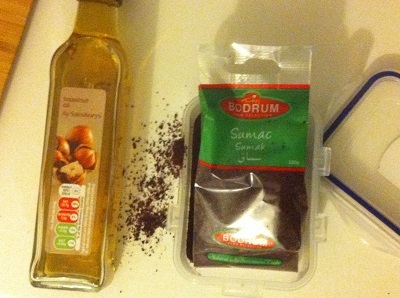 Sumac is something that, now I taste it, I realise that I have had this before on things. It’s salty and tastes weirdly like cranberries. As such, I thought it would be good to add to the pizza sauce alongside my regular ingredients and a sprinkling of Szechuan pepper. 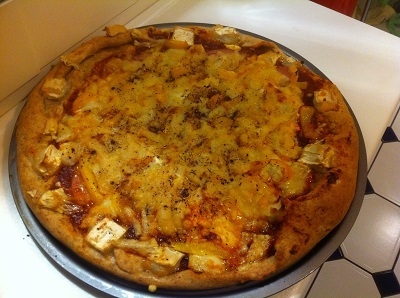 The pizza turned out really well in the end. The hazelnut oil added a gorgrous nuttiness to the dough whilst the sumac in the sauce and sprinkled over the top gave a bit of added saltiness (the fruitiness was lost amongst the goats cheese and smoked sausage). Okay, this is where things are getting a little bit weird with regards to both lists. I kept the generic and speciality versions since I thought I would be able to cross off a lot of them separately. 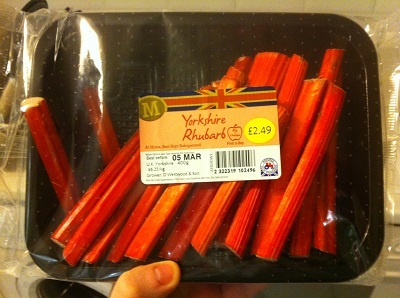 Of course this did not happen here, and I even researched the names of the farmers on the front of this packet to make sure this rhubarb was correct. I decided to stew this rhubarb with some orange juice and ginger before serving it with a lot of custard. Proper gorgeous. 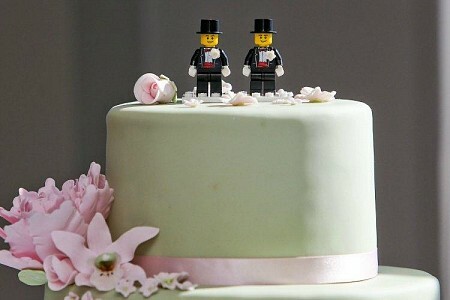 In case you had not gleaned from all of the posts on this blog, this is the year that I will be getting married to the poor sucker of a Dutchman that somehow fell for me. Seriously though, the closer we get to the wedding day, the more it become a real thing and the more I realise that I will be blimp-like in my wedding photos. Still, it’s going to a lovely day. List Item: Have £10,000 in my bank account (not including loans) at one time. Many thanks to my grandfather who left me the money that lead to this, and to my mum for teaching me the value of saving my money. 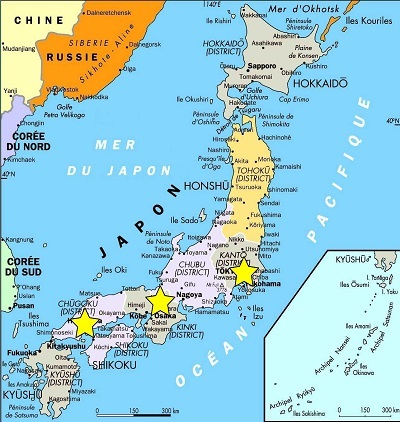 I have been able to plan the trip of my dreams: two weeks in Japan taking in the sights of shrines, Mt Fuji and deadly blowfish. After spending the money on this (what is going to be amazing) honeymoon I have to say that I felt a little sick seeing just how quickly the money just melted away from my internet banking account. Sure is gonna be worth it though, despite the fact that taking away the money for the actual wedding I am basically broke… for now. So here is a benefit I had not thought of when I switched to a looser blog schedule, the chance to have two album posts in a row. This album will have an interesting meaning to me now, the music that was playing when I booked my honeymoon. On a more related note now. Grievous Angel is one of those sad albums which found its initial release after the death of the singer. Gram Parsons, who passed away a few months earlier due to an accidental overdose, is someone that I have already looked at in a previous post. Listening to Grievous Angel it is hard not to hear his previous involvement as a member of the Flying Burrito Brothers. He was a true pioneer in the world of country music due to his mission to properly unite it with rock and roll. He also helped to introduce the world to Emmylou Harris, who is everywhere on this album despite not receiving a proper credit on the front cover. She was meant to, this album was meant to be by both of them until Parsons’ widow intervened and removed as many traces of Harris that she could without compromising the integrity of the album. 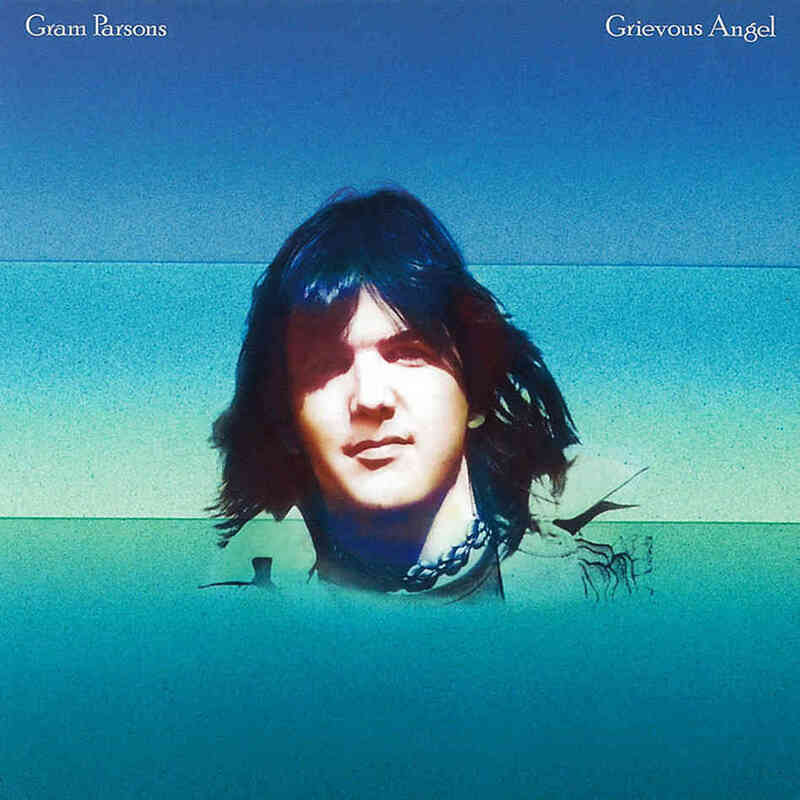 Maybe I am a bit more country than I really realised because Grievous Angel is an album that immediately hit me, unlike Revolver which failed again on a further listen. 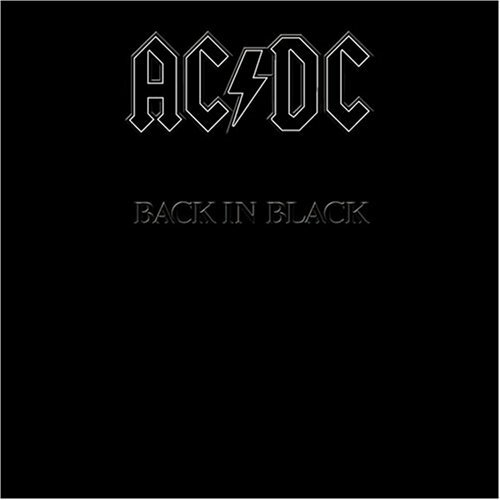 When I listen to this album I can hear pretty much every mainstream country act that has emerged since. Yes, there are the traditional country music hallmarks of twangs and the more maudlin subject matter but with lusher orchestrations and the introductions of more mainstream instruments and tempos this is an album that helped to promote the world of country music to a wider audience. Then again, this was a commercial flop upon its initial release so I probably have no idea what I am talking about. There are no real tracks that I want to pull out since they all work together as a coherant whole. If I did have to pull out one it would be the closer ‘In My Hour Of Darkness’ just for the wealth of ABBA-style harmonies during the chorus.